Mark Beasley, jonCates, Jake Elliott, Alex Inglizian, Tamas Kemenczy, Nicholas O’Brien and Jon Satrom will collaboratively build a A Magic Matrix Mixer Mountain. 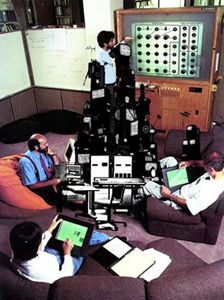 Cobbled together from broken computers, functional microphones, surveillance cameras, local feedback loops and international communication networks, this Magic Matrix Mixer Mountain will rise up from foothills and climb skywards. Audio, video and datastreams will flow up and down from the mountain. Each foothill will be a self-contained system (artist) that sends tributary audio, video and data via a matrix of mixer connections. All these streams are sources mixed in realtime into a multi-channel audio and video landscape. During the performance and installation at Lampo, five of the artists will build the A Magic Matrix Mixer Mountain on-site while two are connected remotely via the Internet. All of the artists (foothills) will feedback and feedforward to expose the graceful musicality of faulty technologies. Decoding and rebugging digital media, the A Magic Matrix Mixer Mountain will exist for one night only but will be accompanied by an operator’s instruction manual, to be written, arranged and printed live in realtime along with the performance of the audio, video and datastreams. Installed and performed live in Lampo, A Magic Matrix Mixer Mountain began through a collaborative process of free association and deep-linked metaphors online. A nonverbal montage of images, animations and videos posted to a group blog documents this process. Collectively, the artists’ collaborative projects have or will be show or presented internationally in Mexico City, Mexico; Madrid, Spain; Montreal, Canada; Linz, Austria; Prague, Czech Republic; Paris, France; Beijing, China; nationally in cities such as Brooklyn, Boston, Philadelphia and Chicago; and online on New Media Art platforms such as Rhizome.org, Furtherfield.org, Turbulence and Networked_Performance. We have organized spaces, events and platforms such as dai5ychain, dorkbot Chicago, r4WB1t5, BUSKER, HARDCoded, Chicago Hackmeetings, [FRAY], The Upgrade! Chicago and Version Festivals (02, 03 and 04). They are on faculty, teaching or have taught at The School of the Art Institute, Columbia College, Marwen and Street Level Youth Media. Mark Beasley is an artist/educator making software, video, performance and web art. Jon Cates makes, organizes and teaches experimental New Media Art, including Art Games, Machinima, Computer Witchcraft, digitalPunk and Noise musics. Jake Elliott is a cyberpsychedelic artware engineer. This is not a metaphor. Alex Inglizian is a sound designer, experimental musician, computer programmer, electronic technician, and educator. Inspired by broken radios, children’s toys, and vintage synthesizers. Tamas Kemenczy branches and merges interactive fiction, the demoscene and programmable spells. Nicholas O’Brien is a media maker and educator interested in the relationship between identity and virtual constructs such as memory, architecture and cyberspace. Jon Satrom performs real-time audio/video, databends multimedia computer files, and creates colorful glitch-ware. He spends his days fixing things and teaching. He spends his evenings breaking things and learning.